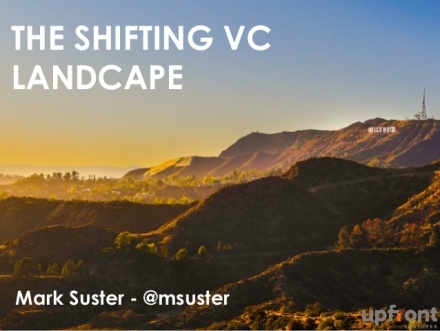 By Mark Suster : Mark is a 2x entrepreneur turned VC. He joined Upfront Ventures in 2007 as a General Partner after selling his company to Salesforce.com. Read more about Mark. 15 years ago we were at the peak of Internet hype with the launch of many over-capitalized businesses with a market size & opportunity was limited. It doesn’t take a huge leap to see how well the VC industry is positioned for the immediate future. Limited Partners or LPs (the people who invest into VC funds) have taken notice as 2014 is by all accounts the busiest year for LPs since the Great Recession began. Stated simply – if you seed funded Uber at $4.5m pre-money valuation you certainly would want to exercise your right to continue investing if you had prorata rights. Seed funds now represent 67% of all funds being created now, which is up 100% from 6 years ago. And while it only represents 6% of the total capital of the VC industry – this is a meaningful shift in structure. At the other end of the spectrum large funds have gotten even larger in the past few years which has massively increased the amount of consolidation in our industry as 66% of LP money into venture is now concentrated in late-stage or full-cycle VCs. Many pension funds are simply too large to write small checks and favor the ability to write $50-100 million checks to funds. If you don’t want to be more than 10% of a fund that implies fund sizes in the $500 million – $1 billion range. Fund of funds (who take money from large pensions, sovereign wealth funds, etc. and break it into smaller sizes) often sell “access.” What they’re really saying is that they have the relationships to be able to invest in Sequoia, Benchmark, Greylock, Kleiner Perkins, Accel, etc. and the bigger funds can’t get in directly. The pioneering fund of funds realize that their source of differentiation is much more about the latter than the former. Initially I had worried about the data that showed “Traditional VC” – funds in the $100 – $500 million size – seemed to be shrinking since the Great Recession in both numbers of VCs getting funded and in terms of total dollars in this class of VC and this seemed to fly in the face of the rise of successful emerging funds. The more data I collected and the more conversation I had with GPs and LPs the more I realized that there was another major factor at play in the concentration of capital in larger funds – many traditional VC firms were now setting up “opportunity funds” or “growth funds.” The data ends up looking skewed towards larger funds when it actually involves traditional VC funds now geared up to take capture more of the value in private funds before they went public. This is a structural shift in our industry few have talked about publicly. When you think about the trends of faster-growing startups due to social networking, credit card enabled and mobile first consumers – the reality is that many startups are becoming very large financially before needing to go public. In reality many of them could be profitable if they chose to. But markets value high growth over short-term profitability. And as long as private-market capital is available these companies would rather remain private for longer before going public. Thus the amount of money that companies have raised before going public had doubled since the Great Recession. The overall trends in our industry have breathed a new life into the venture capital industry. From a period of veering off target with the laziness & riches of the dot com era our industry has greatly righted itself. But the biggest changes in our industry have been driven by technical changes themselves to which we are just observers and fortunate beneficiaries. I highlighted how these tectonic technical shifts have altered the VC industry in this post: How Open-Source & Horizontal Computing Spawned the Micro VC Market. 2007 was the watershed year. Facebook went mainstream after the F8 conference and its big push beyond college campuses. Twitter spread through the tech crowds at SxSW and raised its first venture capital round led by Fred Wilson. The iPhone was released. The “big boom” in startup financing started around March 2009 — more than 5 years ago — and hasn’t abated. Cheap, mobile, social, global, massive, always-on, one-click-purchase has led to the most successful companies of our era hitting unprecedented scale early in their development and has massively shifted the value captured from post-IPO investors to pre-IPO investors as is demonstrated in the chart above. This has led to the rapid rise of: DropBox, Airbnb, Pinterest, Maker Studios, Uber, Lyft, SnapChat, Tinder, Waze, KickStarter and so many more great standouts that have gone from inception to massive in an unprecedented timeframe. From a technology perspective our journey is nowhere near over. Even the most somber of industry analysts must acknowledge that the shift from computers being devices controlled by humans to smart devices that are all computers connected to an Internet cloud – the so called “Internet of Things” – is breeding massive new opportunities. Just see the growth of Dropcam, GoPro and Nest for the tip of the iceberg in what is to come. Of course strongest industry players don’t stand still. Early-stage VCs have realized that they need to capitalize on this trend, which is why many traditional VCs have set up “opportunity” funds that sit alongside their core funds as a means of capturing more private-market (pre IPO) value. Opportunity funds typically have better economics for the LPs who invest in them. Traditional VC isn’t being gutted – it’s being supplemented. Many prominent LPs have also recognized the “prorata opportunity” and have set up “direct investment vehicles” themselves to take prorata stakes in their managers portfolio companies. The biggest response to the public-turned-private value capture, however, has been the push for public market investors to move into the private sphere. Public-company tech investors creates competition in late-stage financings and these investors can afford to be less price sensitive if they choose. The value capture in the private markets has also led some hedge funds and other major non-private-market investors to become late-stage VCs. Many of these investors lack the skills, focus, experience and temperament to make great, patient, long-term, private-market investors. Trying to shoe-horn hedge-fund mentality into venture capital markets cannot portend a happy outcome. Marc Andreessen captured some of this sentiment in his recent “10 Ways to Damage Your High-Growth Tech Startup” Tweetstorm. When the tech markets goes through its next inevitable bear cycle every public market investor will return to their day jobs and abandon the hard work of rebuilding and restructuring the remaining companies who are over-capitalized. We saw this movie already after the dot-com collapse and the sequel will be no different. Publics sold many of their positions to secondary investors. It’s hard to work out the cap table with your peers when one of them has no real intent in fixing the problem. Why do VCs stick around and fix problems in a massively changing financial market? Because this is all VCs do and if we intend to work with all of our fellow VCs and entrepreneurs when the rain ends and the sun shines again our reputations matter greatly. This “game theory” of mutual interests in collaboration even as we occasionally compete fiercely is what forces much better behavior in our industry than otherwise might exist. The result of these new market trends of Prorata Takers, Corporate Investors & Public Market Entrant has led to a sharp spike in the valuations of late-stage financings. While this might not matter for the industries best companies, the definition of what is “best” will clearly be stretched as people compete to get in on perceived great deals. Venture capital valuations are up across every segment of the industry as can be expected by our 5-years of growth markets but they are up most pronounced in the late-stage financings where the median valuation has risen from $66 million in 2010 to $155 million in 2014 (a 24% CAGR). But about that “bubble” we always hear about? It certainly doesn’t yet seem to be the case regarding private tech market companies going public. Not only are they going public later when they are larger & stronger but the valuations upon their debuts are significantly more rational than the public dot com bubble. Amazing opportunities + Risks + Uncertainties for the coming decade. I look forward to the ringside seat to see how this all plays out. Very special thank you to Glenn Poppe at Upfront Ventures for all of his research, number crunching, fact checking and calls to VCs & LPs to confirm our theses. And to Pitchbook for making its data available to us.